This is one of my favorite series. What do you get when you mix: the energetic fire sisters. the tears that fall as the snail fades, a vampire who loves doughnuts,proper oral hygiene that all dentists can approve of, and a neko whose tongue can slice open a persons jugular vein? You get this wonderful series one of my favorites; unfortunately most of the series isn't on crunchyroll. especially "the second season" which is really season 4. and by far the best season.I'd recommend the watch. This is pretty close to the perfect anime series for me, and this is coming from someone who tends to prefer drama over comedy. I've rewatched it several times and every time it's still great. Like with all the (bake)monogatari seasons, SHAFT's production is really excellent. The art style is original and addictive (how cool is Araragi's house?!). The fast-paced dialogs are super fun (in a Gilmore Girls kinda way), and the language puns are very clever (and I'm sure I'm missing some too). The voice acting is compelling without sounding too exaggerated. I love how the supernatural aspects in this show don't dominate: they add some interesting background (both visually and as a plot device) but ultimately they're just the metaphorical vehicle for framing adolescents confronting their psyche. Kaiki's character in the Hitagi End arc sets a high bar for every other anime in terms of how characters can be layered with complexity. He's no longer an antagonist, but he's not an anti-hero either. He is simultaneously absurd and rational, stubborn and comprimising, selfish and selfless. The Shinobu Time arc is probably the weakest in this season (Primer just makes any time travel plot look childish), but it's still great. The "second season" of Monogatari keeps pace and continues the high bar of animation and storytelling that the Monogatari series is known for. This second season dove more into the other characters of the series as well as did some nice quick recaps to help bring viewers up to speed as to what went down in previous story plot lines. A lot of the stories contained within this season were rather touching, the backstory of little miss vampire was explored some more and things even got a bit crazy with time travel all Steins:Gate style. It did have a very touching wrap up to that story arch, as one of the characters is pretty much removed from the stage from that point for the time being. All in all this show continues to be amazing, and the story doesn't under deliver what so ever. I recommend this show hands down, but it's always best to jump aboard the train at the start for this one since there's a lot going on and the story itself doesn't hand-hold anyone. This series strays away from the past seasons. This isn't the usual result where the quality drops and it feels like a quick cash-in or a mediocre Disney Sequel. This is more like what happened to MASH, and I do not say that lightly. They toned down what made Monogatari, Monogatari, but they raised the quality of the story. The story went from comical, amusing, bizarre and wtf; to amazing. This is the best I have found in the Monogatari series, even the ones that followed this. In fact, this is one of the best shows I have seen in a long time. There were plenty of times where something happened in this series, and I thought "This is just to increase appeal artificially" or "this is a quick cash-out", only to be proven wrong. Even if this was so, he pulls it off magnificently. Everything feels like it was done for a reason. Hahaha this anime series is in my personal top 10 all time favorites. The laughs, the drama, the action, the adventure, the tears, the...well EVERYTHING. There is something to like here for everybody. It's hard to find that in most anime (at least the ones I've seen). I've been a huge fan of the Monogatari series since Bakemonogatari (a friend got me into it). All I can say is, if you can drag me through each season INCLUDING the character extra seasons then you're definitely doing something write. Another plus, it's animated by SHAFT. Besides the signature head tilts we all know and love, the SHAFT style really complements this light-novel-adaptation-into-anime. You won't have any regrets with this smart and cleverly written series. This may be posted as an overview for this season only, but it's really an overview of the entire Monogatari series up to this point. I've come to love the Monogatari series. It truly deserves it's hype, something I was questioning before. Only now after having watched it, do I realize how influential it is, in the anime world and it's fandom. The characters are great, you're given enough throughout a period of time to truly fall in love with the characters, some may go, but their impression stays and you feel like they've fulfilled their duty as characters once they disappear. I've come to love and expect the bizarre nature of how the series is played out. The narrative of each arc. is well explained and goes smoothly. All the talking is truly fun to listen, and how each scene changes angle and you're taken to different places as they converse, all that randomness that plays out is something that feels natural and it feels strange after watching other series, you come to expect that sort of thing. I never thought I loved this series so much. The only thing I can complain about is... Koyomo Araragi. Never has a protagonist been so useless and beaten so much. I can't say I 'hate' him, but I do. It's complicated. He's so useless I need to emphasize that once more. Although I was a little skeptical at first of the art style and the show's pace, it grew on me. It has action, comedy, romance, a little bit of gore, some "plot". Basically everything all wrapped up in a neat little package delivered to you from someone full of witty remarks and banter. All I can really say is that this is the single best anime I have ever watched, and I recommend it to anyone who is into any genre of anime. 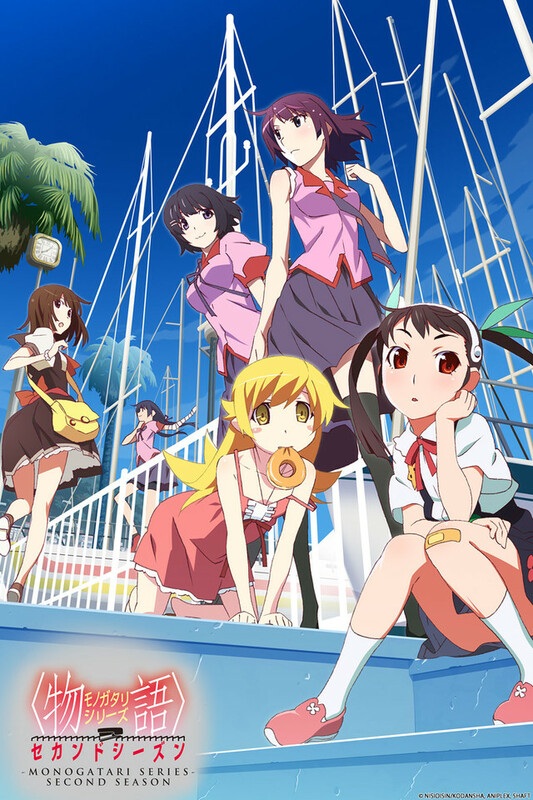 I believe the Monogatari series to be one of Shaft's most famous works, and with good reason. Bakemonogatari, from its art style and music, to the way its plot and situations were presented, was particularly unique and simply gorgeous. Nisemonogatari continued as a natural fit, and Nekomonogatari Black wraps up the first season (along with the still-MIA Kizumonogatari movie). That is where the second season steps in, and boy does it have big shoes to fill. The second season concentrates much more on the plot this time around, sadly at the cost of many of the arbitrary, aimless, and yet amusing conversations of the first season. The plot, though, is great, and features the same great characters of the previous animes. Some of them are even narrators, giving them more personality, and providing another look into this world. You can enjoy these stories no matter how much you read into it. Taking everything at face value, you'll get a good series out of this, and if you pause to catch the text screens, or look at the events with a more intellectual eye, you'll still find things to whet your brain's appetite. I think it's a wonderful thing about this whole series, and this season continues with no exception. The art continues in the distinctly unique and stylistic way of this season's predecessors, although maybe not as unique and weird as before, perhaps again due to the further concentration on the plot. I do expect things to be up to full-stylisticness-standard when I feast my eyes on the Blu-Ray releases though, but what we have now is certainly not bad by any stretch of the imagination. The opening and ending songs are definitely amazing, alongside their appealing animations, with the final opening sticking out most in my mind, but the background music is something I'll have to knock this season for. While it wasn't bad, it wasn't quite as memorable and unique as the background music of Bakemonogatari, and a number of the tracks ended up being repeated a lot. All in all, the second season of Monogatari continues with a lot of the goodness that was its predecessors, and any Bakemonogatari fan wouldn't dare miss this. As others said though, do watch the first season before coming back here, as beyond some sprinkled in summary/recap episodes, the anime assumes you have prior knowledge.